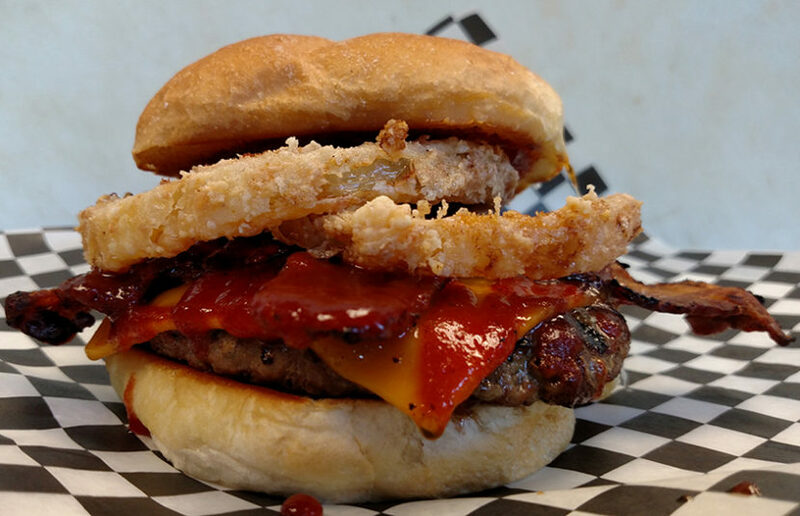 Try this classic burger combination of crispy fried onion rings, melty sharp cheddar cheese and crisp thick-cut bacon with the sweet and spicy flavors of Jay's Wicked Barbeque! Cook the bacon until nice and crispy. Season the burgers with salt and pepper, then place them on a hot grill until they're almost done- top with the slices of cheddar, then put 2 slices of the bacon on top of the cheese. Drizzle a tablespoon of Jay's Wicked Barbeque over the bacon. By now the burgers should be just about done, so top it off with a couple of onion rings. Toast your rolls while you're at the grill, then spread a little Jay's Wicked Barbeque on the tops and bottoms. Slap the burger on, and put it in your mouth!